Please forward this newsletter to anyone you know who might be interested in piano related articles, stories, news, etc. They can subscribe too, it's free. I Drove Over 3000 Miles to Play This Piano! Last month Kathy and I drove from the west central coast of Florida up to Maine and back. It wasn't until we arrived in Vinalhaven, Maine (an island off of Rockland, ME) that we found the first three. The adventure part was easy, the entire trip was one big adventure. The piano I'm standing next to in the picture (yes, the chubby guy with the subtle Piano World t-shirt is me) was in tough shape, but the crowd in the restaurant was appreciative and fun to play for. In fact they asked us to come back the next night, which we did. The piano in the church near the Victorian B&B we stayed at was quite a bit nicer to play. We happily found all of our quests (and then some) on Vinalhaven... pianos, a lighthouse, adventure, friendly people, good food, and cooler weather. And if you like lobster (I love lobster) this island is the place to be. The majority of people on the island make their living lobstering. I never saw so many lobster boats in one place. And it's amazing how they get them all to park in the same direction (local joke). Our little adventure actually took us about 15 days during which we got to visit friends and piano stores (and friends who own piano stores), relatives, beautiful scenery, lighthouses, more pianos, great local restaurants, and so much more. It was one of the most relaxing and enjoyable trips either of us could remember ever taking, and it reminded us of how much we miss the Northeast. Although we live in Florida now, we are both transplanted New Englander's. We're seriously considering trying to find a Victorian in Maine or NH (where houses and land are still fairly reasonable). Sherwood Community Music School, 1312 S. Michigan Ave.
Qin Fan was born in Shanghai, China in 1991 where she began playing the piano at the age of four. She moved to Chicago in 2009 and is currently a scholarship student of Evelyne Brancart at the Jacobs School of Music at the University of Indiana in Bloomington, where her playing has been praised for her sensitive musical feeling and refined technique. 18-year-old pianist/composer Conrad Tao is the recipient of one of only two Avery Fisher Career Grants in 2012 and is a 2012 Gilmore Young Artist. In 2011, Forbes named him one of "30 Under 30: The Youngest Stars in the Music Business," alongside Lady Gaga, Nicki Minaj, Adele, etc. He was the only classical musician on the list, and tied with Justin Bieber as the youngest. Beginning in the late 19th century, music in ballet became just as important as the choreography. Svetlana Belsky will discuss Russian ballet music and play selections of Prokofiev and Stravinsky that are transcribed for piano. Children ages 6-12 and their families are invited to join us for this new series about the piano! Each 45-minute "informance" will include performance and discussion about different topics related to the piano and piano performance. Followed by a milk-and-cookies reception. As I have mentioned before, Kathy and I volunteer at the Palladium Theater in St. Petersburg, FL. They have great concerts and shows. If you're in the area Check Out The Events at the Palladium We will be working on this Thursday night, August 16. If you are in the Massachusetts area, be sure to check out the events put on by the wonderful folks at the Frederick's Historical Piano Collection in Ashburnham, MA. Fredericks Events Details And by all means, check out their unique collection of historical pianos. Wanna Know Why You Should? Do you ever visit our other forums? If you are searching for a new piano or curious about your old/current one, you likely want to be visiting the forum called Piano Forum. And don't forget to check "Active Topics" (see links at top of forums page) This shows you the most active discussions going on right now. Threads with things we found interesting, unusual, or just fun! For the folks in the Adult Beginner Forums (somewhat of a misnomer, as they aren't all necessarily beginners). That's right, our members have created their own online piano recitals, and they have lots of fun doing it. This one is tough to watch, but it's a fact there are lots of pianos that are beyond saving (or not worth the investment), so they end up like the ones in this video. Better late than never. A member who found Piano World, the forums, and its members helpful in his search for the right piano decided it was time to say thank you. Please read his well thought out post, and some of the responses from members. Colorado Piano Players - Party Time? There is a possible new Colorado Piano Party Forming. We already have some pretty active members who have held their share of forums parties. Looks like someone new would like to step up to the plate. Colorado Piano Forums Party Forming? Multiple Accounts - A No-No! Please do not create multiple accounts on our forums! The practice is deceptive and could get you banned. There are very few exceptions to this rule, and they must be approved on a case-by-case basis. If more than one person in your household wants to log onto the forums with their own account, please be sure to contact a moderator or me directly BEFORE they create their account. We track all IP addresses and automatically receive reports when multiple accounts show up against one IP. If/when we discover you have multiple accounts we may ban both unless we hear from you with a legitimate reason. I figure it's good to keep these discussions going so we can gather input from multiple sources about what is/isn't working for them (both teachers and students). I realize there is no substitute for a live one-on-one lesson, but sometimes (like when the teacher you want to study with is 1000 miles away) it isn't practical to take the lessons in person. I know a few of our well known musicians/teachers (Jeffrey Biegel, Steve Barta, Rob Mullins) have used Skype successfully. Well things are still a bit slow around here, you can tell it's summer. Why just look at poor Kirby here. He used to be a Saint Bernard, but I left him out in the Florida heat too long, and look at him now. Fall is just around the corner, and before you know it winter will be here. Well, not here, but up north. Here in Florida we only have two seasons ... Hot and Really, Really Hot. Soon people will head indoors and rediscover the piano, we will get busier and the newsletters will get longer. I have to go crank up the AC now before Kirby turns into a gerbil. 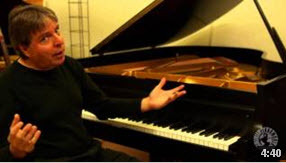 If you haven't seen these yet, check out our new series of short clips by concert pianist and owner/host of Living Pianos, Robert Estrin. Robert has been creating a series of free videos for us in which he shares some interesting insights about piano playing technique. His enthusiasm is catchy and you just might learn something. Additional videos will be coming out periodically throughout the year. Saw this on Facebook and wanted to share it with you. Piano World is a small business, supported by advertising on our site and sales in our online store, PianoSupplies.com Please support small businesses, including us. party goods, piano tuning equipment, piano moving equipment, and more. Simply enter SAVE10 in the coupon box on the payment page during checkout. Remember to enter SAVE10 in the Coupon Box on the Shipping/Payment Selection page during checkout. 10% discount does not apply to advertising, information requests (like How Old), shipping, sales tax (where applicable) or products for which we are an affiliate (sheet music, poster art). This discount cannot be applied to previous purchases or combined with other offers (except you can use it with the Jansen Artist Bench free shipping offer). Our piano forums recently passed the 66,000 registered members mark, and during the past year we've seen over six million unique visitors arrive at Piano World, and they've requested over thirty three million page views. All of which adds up to making advertising on Piano World a no-brainer if you are in a piano related business. Whether your piano business is local, national, or international, we've got you covered. Advertising Information page at: www.PianoWorld.com/advertising for information about placing an ad in our Classified's button display ads on the forums and/or run of site, or in this newsletter. 66,000+ Forums Members, Over 1.9 Million Posts, and still growing!